I love Ilog Maria Honey. Located in Silang, Cavite, Ilog Maria is owned and operated by Joel and Violaine Magsaysay. The honey they harvest and package onsite is a testament of their passion for creating the very best of this sweet, golden syrup. Since A. and I found ourselves in the area, we decide to pass by and pick up a ‘few’ bottles. With a shelf half-filled with honey, I figure it’s time make an ice cream I’ve wanted to concoct for a while now. This ice cream was inspired by a dessert I had at a Greek restaurant (whose name escapes me at the moment). It was in a short glass filled with a cool, Greek yogurt covered with a layer of sweet, citrus-flavored honey. The dessert was finished with roughly chopped pistachios sprinkled on top. So simple, yet so amazingly elegant. An unforgettable dessert. I’m actually surprised I didn’t make this ice cream sooner. Pour 1 cup of the cream into a medium saucepan and add the sugar and salt. Add the honey into the pan and warm over medium heat until the sugar and honey are fully incorporated. Remove from the heat and add the remaining 1 cup of cream and 1 cup of milk. Chill the mixture thoroughly in the refrigerator. When ready to churn, freeze the mixture in your ice cream maker according to the manufacturer’s instructions. During the last few minutes of churning, add the salted pistachios. Most cookbooks suggest freezing the churned ice cream for at least two hours. I usually like freezing mine overnight. I like make sure that everything properly sets. It’s an excruciatingly long wait. By the next morning, I’m up early. Time for an early morning taste test. I take my first spoonful. The velvety smooth cream gives way to the orange, citrus tones of the honey. It is sweet but not overtly so. 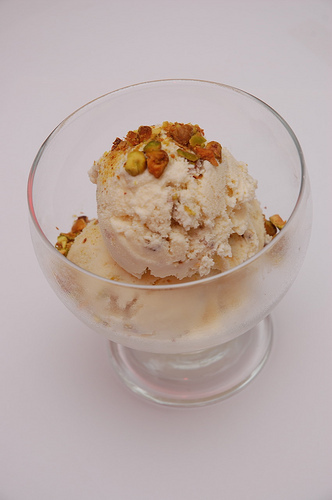 The creaminess is broken up by the crunch of the mint green pistachios. The nuts are still salty but their savoriness only helps highlight the sweetness around them. This frozen dessert is all about the honey. My wait for the right kind of honey was well worth the delayed gratification. To date, this is my favorite ice cream. Franco’s Note: A reader asked me off-line why I always make my ice creams, Philadelphia-style a.k.a. without eggs. Answer: For whatever reason, the people I make ice cream for seem to like it better without the custard-like quality the eggs bring to the mix. Thank you to Eric Lacson for the lovely photo. Ilog Maria's a godsend. I love their honey, the honey shampoo, the wax they make for wood, and even have a couple of their wooden buckets. Would adding some citrus zest to the milk mixture compensate for the lack of citrus infused honey? Hi Mila. It probably will but I would suggest making it peels instead of zest and fishing out the peels after letting the mixture stand for a while. Unless you want the zest as part of the ice cream. Honestly, extracts work just as well. As for the citrus flavoring of the honey, like wine, different honeys have their own characteristics. I like Ilog Maria because of the orange-lemon flavor but I would probably find honey flavored like apples, berries or even wheat interesting as an ice cream. What kind of ice cream maker do you use and where can I get one? I can't wait to try out this ice cream recipe. Another Ilog Maria fan here! Not just of their honey (which I try to keep a constant supply of), but of their soaps, stingless mosquito repellant, and ointment. This ice cream is something I have no doubt I would LOVE! That dessert you speak of (yogurt layered with honey and topped with pistachios) is one of my favorites as well, but I love it more for breakfast. One of the best I've tried is Zuzunis and Mattis. Hi Nena. Any fan of Ilog Maria would love this ice cream. :) As for the yogurt dessert, I think it was Mattis but I not sure. :P Btw, where is Zuzunis? Thanks for the tip Franco! Don't worry, I think I love ice cream too much not to at least "attempt" to make my own batch. Cheers!